As you can see from the large number of one-of-a-kind pieces on our website, we love making very special, personalized pieces. Our customers have appreciated this service for over thirty years, and very highly rate their experiences in helping us to design their pieces to order. We will etch a picture of your own favorite boat or scene on a chunk of Fossil Ivory of your choice. Handcrafted wood mounting options include hand-turned Walnut, Rosewood, Pine, Oak or Cherry bases. Also available is the option of a handcrafted Sterling Silver base. Fine Wooden Boxes and Humidors With Personalized Fossil Ivory Plaques and Escucheons. Just email us and we will answer any questions you might have regarding how to order these very personal pieces. The 4 1/2 inch piece shown in the photo above is Medium Tan Mammoth Ivory (with some bark), set on a hand-turned base of Rosewood. 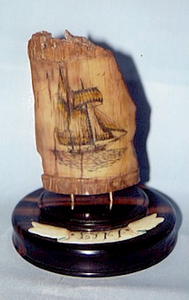 It has a carved Fossil Ivory banner with the ship's name set on the base. The scrimshaw is a rendition of the wonderful new reproduction topsail schooner "Lynx," built and launched in Maine in 2001.